How much does refractive lens exchange cost? 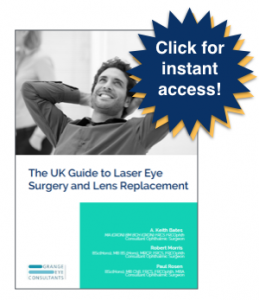 People often ask why is refractive lens surgery more expensive than laser eye surgery. And the reason for this is that it’s more involved. The diagnostic tests that we need to perform are greater and patients need to go into a full operating theater with lots of equipment: You need a microscope, you need a laser to start to carry out a lot of the lens procedure, you need a machine to extract the lens. And then the lenses that we use, the multifocal lenses, are extremely expensive. Particularly if you have a complex prescription, the multifocals often need to be made on an individual basis and so they are completely customised for you. So it’s the fact that there is a lot of technology involved, it’s a very highly skilled and detailed procedure that not all surgeons can perform, and the lenses are so expensive. Rob Morris is a Consultant Ophthalmic Surgeon at The Grange Eye Consultants. His special expertise is in cataract and refractive surgery, including Refractive Lens Exchange, and adult squint. He has over 30 years experience in treating people with eye problems. Rob Morris founded Grange Eye Consultants to manage the increasing demand for more complex refractive surgery. He leads clinical trials investigating novel eye treatments. He is currently Medical Director at Optegra Eye Hospitals. By Grange Eye Consultants|2016-03-11T10:03:07+00:00August 18th, 2016|Refractive Lens Exchange, Robert Morris, Video FAQs|Comments Off on How much does refractive lens exchange cost?